Macmillan Cancer Support and Weston Area Health NHS Trust have opened a brand-new centre at Weston General Hospital for local cancer patients and their families. 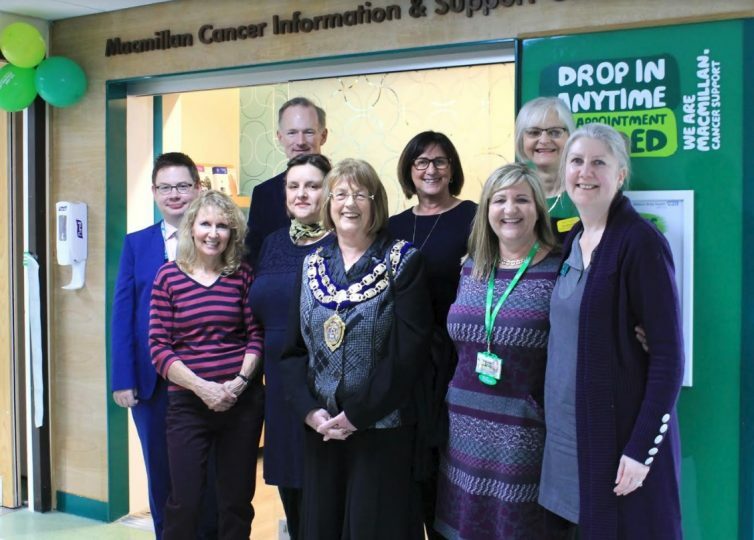 The Macmillan Cancer Information and Support Centre was officially opened by Mr John Penrose MP and The Mayor of Weston-super-Mare Councillor Mrs Jocelyn Holder. Guests, including Dr Peter Collins, Medical Director Weston Area Health NHS Trust, hospital staff, volunteers, supporters and patients came together to enjoy an afternoon tea party to mark the occasion. The new Centre will offer confidential support, information and advice to anyone affected by cancer. Local patients, family members and carers are welcome to wide selection of information available on a range of topics related to cancer such as: support for carers; managing side effects and fatigue; benefits advice; travel insurance; how to talk to children about cancer; and many more. The team of staff and volunteers can help people to access emotional support, counselling, advice about benefits and finances from the North Somerset Macmillan Benefits Advice service. They can also signpost to other support available locally where needed. The new facilities include a large resource room with information displays and tea and coffee making area, a quiet room (for one-to-one confidential sessions) and a separate office for staff and volunteers. The design of the Centre is the first of three pilot designs (themed around ‘air’, ‘water’ or ‘earth’) being trialled nationwide by Macmillan Cancer Support. Based in Weston, the new centre is appropriately themed around ‘water’ with the lighting, layout, colour-scheme and furniture designed to create an uplifting and calm experience for visitors. There are specially commissioned artworks by artist Julia Contacessi and a light box in the quiet room to add a further calming dimension to the space. The new Centre was developed in consultation with patients and staff to ensure that it meets the needs of people affected by cancer. “The aim of the new Centre is to provide a space where people can get support in a warm and non-clinical environment, which has a relaxed and welcoming atmosphere. I’m really proud of the new facilities and hope local people will find the support available here a huge help to them when the need it most.” said Macmillan Centre Manager Emma Pugh. Speaking about the new centre, Dr Peter Collins, Medical Director Weston Area Health NHS Trust said: “This is a superb new facility that will be a valuable part of the care our teams provide to people living with cancer. When anyone is diagnosed with a potentially life-threatening condition, worries about loss of income or benefits and how treatments may impact on lifestyle can add extra anxiety to an already difficult situation. “As a clinician involved in cancer care myself, I know that access to good quality, trustworthy and easily understood advice and information can improve a patient’s overall wellbeing.Having a place to come and learn about living with and beyond a cancer diagnosis is really important and we are extremely grateful for the investment from Macmillan Cancer Support. The new, purpose-built centre with more space and improved facilities is designed to meet local needs and was made possible by a £173,000 investment from Macmillan Cancer Support and £10,000 from Weston Area NHS Trust’s Oncology Haematology Day Unit Charitable Fund. The development follows four months of building works to replace the original centre which was first established back in 2004. Macmillan Cancer Support and Weston Area Health NHS Trust have been working together in partnership for many years to provide the best possible support for people with cancer, and there are 26 Macmillan professionals based at the Trust. The new Macmillan Cancer Information and Support centre is located on the first floor of Weston General Hospital – opposite the Sandford Ward – and is open Monday to Friday. Simply drop in to have a chat with one of the team – no appointment necessary.